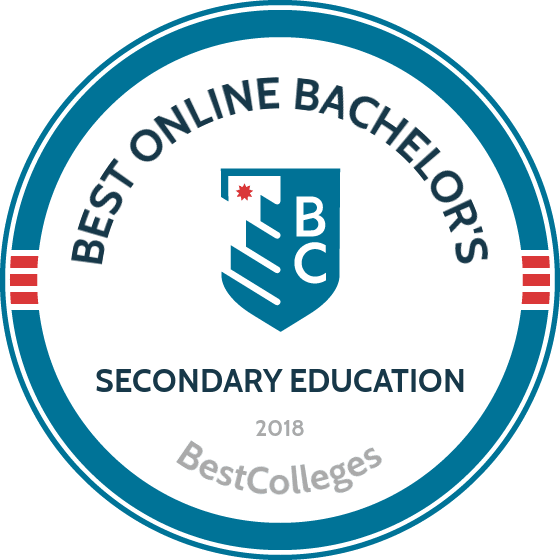 What Are The Best Online Bachelor's in Secondary Education Programs? What Will I Learn in an Online Bachelor's in Secondary Education? The need for qualified, dedicated high school teachers isn't likely to disappear anytime soon. The professionals who pursue these careers help high school students succeed and form an integral part of the communities they serve. If you are considering an online bachelor's degree in secondary education, you will be joining a steadily growing workforce of inspiring and well-educated teaching professionals. This page will serve as a guide as you navigate the process of choosing the best secondary education degree program. One of the nation’s biggest names in online education, WGU offers fully online bachelor’s and certification programs in secondary education. WGU offers science and mathematics programs in grades 5–9 and grades 5–12 and an English program in grades 5–12. All WGU students complete competency units (CU) in lieu of credits. Students earn CU as they demonstrate mastery of topics. If they are already familiar with topics, they can test out to quickly earn CU. Coursework is delivered asynchronously, allowing students to earn CU at their own pace. Completion times vary widely, but students with no prior college experience typically complete WGU’s teaching programs in four to five years. Students earning their secondary education degree online from WGU maintain complete control over the pace of their education. Students pursuing an online bachelor’s in secondary education from FHSU graduate with a double major in both secondary education and in one of 15 specific subject areas. Students graduate with an endorsement for middle and/or high school licensure in their chosen subject area. The only subject option currently offered fully online is business. All FHSU students earning their secondary education degree online complete 55 credits of general education, 19 credits of secondary education core, and 12 credits of student teaching. Core coursework includes instructional technology, educational psychology, and educating exceptional students. The business specialization includes classes in teaching general business, marketing, and computer studies. Graduates teach accounting, business, and entrepreneurship courses. A liberal arts college located in Arizona, PC’s bachelor’s of arts in education and teacher preparation program requires 60 credits of general education and a 60 credits of major classes. The program’s liberal arts approach extends to the major core; the curriculum includes seminar-style courses dealing with the future of education and multicultural and environmental factors in education. The program is structured in a hybrid format and requires a limited on-campus residency in Arizona, including orientation. However, online students complete student teaching in their individual communities. To accelerate completion time, students may apply to receive credit for life experiences. Though Union is located in Cincinnati, the school’s bachelor’s in secondary education program prepares students to teach diverse classrooms in the state of Florida. All applicants should be preparing for eligibility for licensure specifically in the state of Florida. The asynchronous program consists of 120 semester hours and may be completed on a full-time or part-time basis. Union’s generous transfer policy allows students to apply up to 90 approved hours toward their secondary education degree. Asynchronous online classes begin every eight weeks. Coursework includes studies in classroom management, educational assessment, and psychological and sociological foundations of education. Students complete three capstone experiences: student teaching, a student teaching seminar, and a classroom organization course. Students may concentrate in secondary math, science, English, or social sciences. Located along the historic California Trail in Elko, Nevada, GBC offers a bachelor’s of arts in secondary education program that prepares students for licensure in Nevada. Because of its location, GBC’s program focuses on rural education. The program partners with six local, rural school districts to provide field experiences for online students who choose to visit campus. In addition to earning their secondary education degree, students may concentrate in biological science, business education, English, mathematics, or social sciences. The program centers on student teaching experiences, during which students are regularly evaluated using a rubric. The program combines student teaching with flexible, asynchronous coursework. As you research the available secondary education degrees online, it's important to remember that each program is unique and may have different program requirements. Programs may differ in admissions criteria, program length, available courses, and thesis/capstone requirements. Below is a list of sample courses that you may encounter while pursuing your online bachelor's degree in secondary education. Practicum in Secondary English Observation is an integral part of most secondary education programs, even those offered online. This particular practicum course centers around secondary English courses. By observing practicing English teachers, students will learn to reflect critically on issues related to curriculum, implementation, and classroom management. Teaching Internship Internships in the field generally come after the student completes necessary practicum coursework. These internships often entail entering a secondary classroom in a specific content area (such as English, social studies, or science), and teaching lessons alongside a mentor teacher. Early Intervention Strategies Interventions are important for struggling students in any content area, but most early intervention strategies target students who are having difficulty with reading, writing, or math. This course teaches you to help struggling students succeed through lesson plans tailored to the individual needs of each student. Checking a school's accreditation is a crucial step in the college application process. Accreditation is a way of ensuring that a school meets minimum standards of academic quality. Accreditation is also important because the degrees and credits earned from unaccredited programs may not be recognized by other institutions or potential employers. A school can be accredited through regional or national agencies, but regional accreditation is the more popular of the two. Regional accrediting agencies are widely recognized and degrees/earned credits from regionally accredited schools are more easily transferred to other institutions. Besides regional accreditation, some majors may also have field-specific accreditation. For example, many online degrees in secondary education are accredited by the National Council for Accreditation of Teacher Education. Consider looking for this specific accreditation when researching programs. The U.S. Department of Education and the Council for Higher Education Accreditation both offer comprehensive databases of all regionally and nationally accredited institutions. Choosing a school from one of these lists is very important, as students enrolled in unaccredited schools are ineligible to receive federal financial aid. While it may seem like graduates of secondary education degree programs only go on to work as high school teachers, there are a number of other career options in the education sphere — even ones that exist outside of a traditional classroom setting. The list below outlines a few of these career possibilities. These teachers work specifically within secondary school settings. They may work in public schools, private schools, or even in magnet or specialized schools. They generally focus in a specific content area, such as English, mathematics, social studies, or the sciences. Special education teachers work closely with students who possess a range of special needs, including physical and mental disabilities. These teachers work at all levels of education, and sometimes work with small groups of students throughout their high school years. These educators work with people earning their GED or high school equivalency diplomas. Their students are generally adults of all ages who want to earn an education credential in order to qualify for certain job opportunities. Teachers of this kind may work in a number of content areas, including adult literacy. Sometimes called vocational teachers, these professionals teach students to work within technical careers, including culinary arts, cosmetology, and automotive repair. Some experience in the specific vocation they are teaching is generally required. Athletic coaches at secondary schools often wear many hats in their jobs. In addition to being coaches, they are often certified teachers. Coaches must also have some level of experience with a particular sport at either the amateur or professional level. As you may have noticed from the list of careers in the previous section, there are a range of potential job options for graduates of secondary education degree programs. On top of other rewards, like the satisfaction of helping high school students achieve their goals, these careers also offer competitive salaries. While the median salaries of most secondary education jobs range from $50,000 to $58,000, coaches and scouts may earn considerably less than full-time educators. Figuring out how you will finance your bachelor's degree can seem daunting, but there are some simple steps you can take to find ways to pay for your degree. The first and most important step is completing the Free Application for Federal Student Aid (FAFSA) for each year that you are enrolled. This application connects you with any available federal funding, including grants, scholarships, loans, and work-study awards. Students earning their bachelor's degree in secondary education may also be eligible for major-specific grants and scholarships that are available for future educators. On top of federal financial aid, look into scholarships offered by teacher education associations and organizations to see whether you qualify.